The Audio Demo Rooms are a show unto themselves at InfoComm, and every room has a different story. Here is the final installment of the InfoComm Daily’s three-part preview. 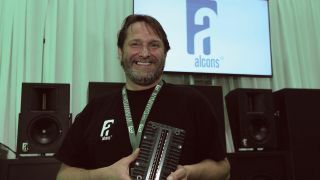 Alcons Audio's David RahnThis might be the last day of the show, but there is still more immersion ahead. Try out Alcons Audio’s true object-based immersive audio experience presented in partnership with Astro Spatial Audio in Demo Room W221A. Powered by the Astro Spatial Audio SARA II Premium Rendering Engine, the Alcons system will feature CRMS three-way reference screen systems and CB121sl shallow subwoofers, and a selection of CRS8, CRMSC-SR and CRMSC-SRIW pro-ribbon reference surround speakers. The system will be powered by Sentinel10 amplified loudspeaker controllers, delivering 20 channels with full AES3 96kHz digital feed. Also on demonstration will be Alcons LR7 micro line array modules, RR12 point-source array modules and QR24 modular, two-way column loudspeakers. dB Technologies will be flying three stereo systems in Demo Room W224F, including Ingenia IG3Ts paired with SUB 18H, DVA Minis with their MS12 flyable 12-inch subs and the ViO L210 with S318 subs. dB will also be demoing the new ES 2103 portable PA, along with the LVX XM and DVX DM TH monitors. On show as well is the Moving D wireless system, which operates in the entire UHF Band from 470 to 790MHz. Martin Audio's Lee SteinMartin Audio will be demoing four new products in Room W224D, including the Wavefront Precision Series line array system, the XE Series and LE Series Stage Monitors and IKON Multi-Channel amplifiers. In addition, they’ll be demoing CDD passive and CDD-LIVE active (with Dante Networking capability) loudspeakers that have enjoyed success in HOW and Entertainment markets, plus their MLA Compact and Mini loudspeaker array systems. Bosch (Demo Room W221BC) rocks the nouveau products with the compact new EVC series addition to the Electro-Voice EV-Innovation family and the premiere flight of the new X12-125F flying subwoofer for the X-Line Advance line-array family. Also enjoy the sonic benefits of a new smart amplifier line with an eight-device GUI. RCF's Roni NevoRCF (Demo Room W230A) targets live sound in the HOW market with its HDL6-A active, two-way line array. And check out the D-Line Series “speaker on a stick” active products that were recently upgraded with FiRPHASE DSP filtering for better linearity and output. As usual the Danley Demo Room (W224G) offers cool jazz demos up through bone-shaking bass, but the biggest draw this year might be Mike Hedden talking about the Danley speaker configuration in the new Mercedes Benz Stadium, home of the Atlanta Falcons. In addition, Danley will be showing the new SM80LF loudspeaker—the power of an SM80 and two TH118’s in a single box and the new Jericho 6 horn, which features PHD (Paraline High Density) Technology.